(Orlando, F.L.) 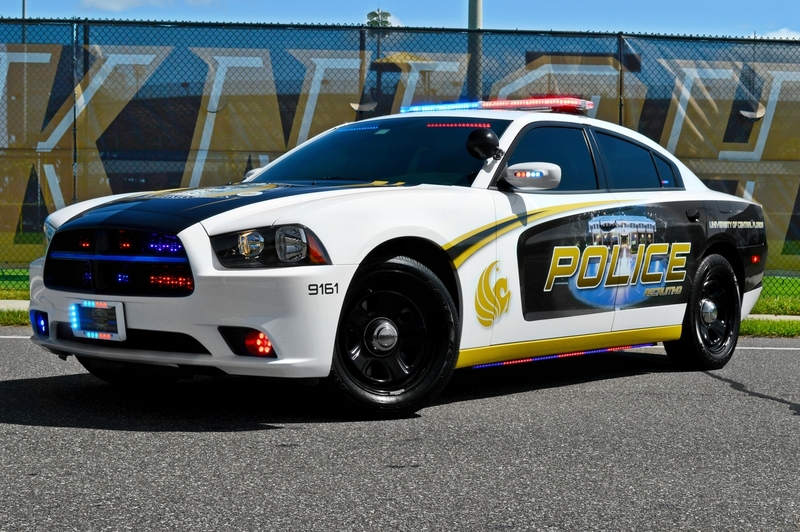 – The University of Central Florida recently introduced a 2014 Dodge Charger “Recruitment Unit” to the agency’s fleet. Special attention was given to this particular vehicle to ensure that it had a unique look that would turn heads, and inspire both student’s and area Law Enforcement to consider pursuing a career with the UCF Police Department. The bold design was created and applied by TechnoSigns and offers numerous visual cues that instantly grab your attention. The most noticeable aspects include the seamless use of the university’s gold and black color palette to create a package that both compliments and enhances the Dodge Chargers muscle car inspired lines. Within the design itself, you’ll find a unique landmark on campus prominently featured on each side of the vehicle. Additional elements include the UCF Pegasus emblazoned on the hood and each door, a long with a thin blue line across the grill. To complete the package HG2 Emergency Lighting upfit this vehicle with an assortment of their custom designed products and a Whelen lightbar to round it out.